From the "Far-Flung Adventure" series, this is the tale of a small boy, Hugo Pepper, and his exploits. Hugo discovers that the sled they arrived in has a special compass - one that can be set to 'Home'. And so Hugo arrives in Firefly Square - to discover a group of very special friends, and a dastardly enemy, with snowmen, and a buried treasure. 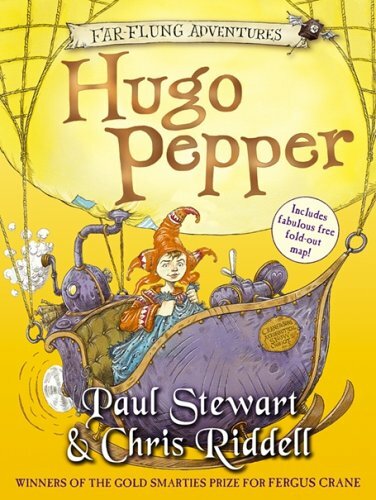 A brilliantly inventive, fabulously illustrated addition to the "Far-Flung Adventure" series from the award-winning, bestselling author and illustrator team, Paul Stewart and Chris Riddell. Set in the same world as Fergus Crane and Corby Flood's stories, this is the tale of a small boy, Hugo Pepper, and his amazing exploits. Raised in the Frozen North by reindeer herders, his parents eaten by polar bears when he was just a baby, Hugo discovers that the sled they arrived in has a very special compass - one that can be set to 'Home'. And so Hugo arrives in Firefly Square - to discover a group of very special friends, and a dastardly enemy...With three-toed snowmen, a secret buried treasure, and a host of fabulous stories, this is a fantastic new tale in this series.